It’s no secret that I love potatoes. 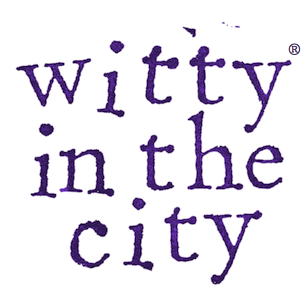 Crispy layered, twice baked, fingerling, whatever! 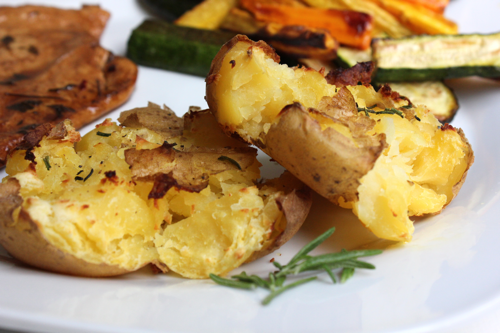 Here is another potato recipe that I love eating as a side dish with any meal. These smallish potatoes are boiled, smooshed, seasoned, and baked until they are crispy on the outside and soft on the inside. This is also the first recipe I ever made from the Pioneer Woman’s blog, and I’ve been going back to her for inspiration ever since. This recipe is best made with small, round, thin-skinned potatoes. New potatoes or Yukon golds work really well. 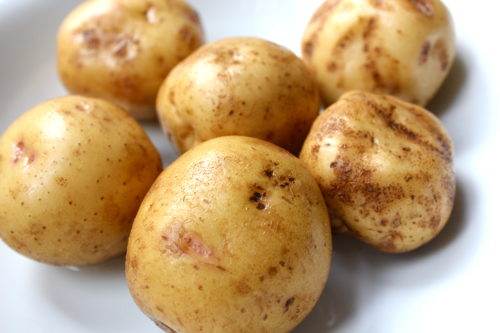 Put your potatoes into a pot of boiling water and let them cook until you can stick a fork into them easily. It shouldn’t take more than 20 or 30 minutes. Also, preheat your oven to 400ºF. 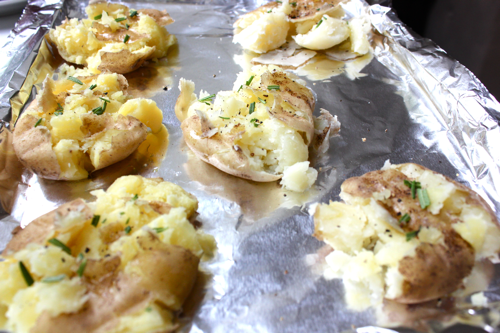 After the potatoes are soft, drizzle a sheet pan lightly with olive oil and put the potatoes on it. Take a potato masher (or something similar like the bottom of a drinking glass) and press down on the potatoes so they flatten to about 1 inch thick. It’s really important to make sure the potatoes are cooked enough for this step– I didn’t wait for them to boil fully the first time I made them, and when I pressed down on the too-hard potatoes (sitting on slippery oil), they flew all over my kitchen. A little patience would have saved me from cleaning up a big mess! Drizzle some more oil on top of the potatoes and season them with salt, pepper, and rosemary (or another herb of your choice). Put the potatoes in the oven and let them bake for about 20 minutes until they are golden brown and crispy. Serve them as a side dish for any meal. 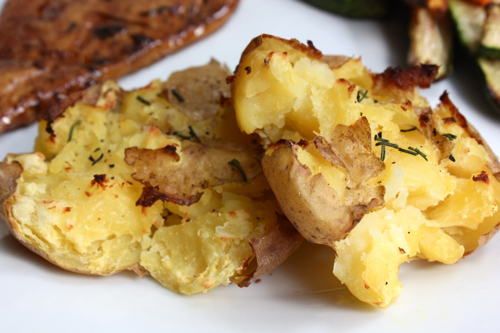 These potatoes are a real crowd pleaser, so get ready to make them frequently! This recipe was adapted from the Pioneer Woman Cooks. I made these for dinner tonight. They look so yummy.